EasyCart allows you to sell virtually any kind of product you can conceive. Retail goods, downloads, gift cards, donations, service based products, subscriptions & memberships are all possible by constructing a well built product in this section. While we offer a vast array of options and settings at the product level, you can still keep it simple by entering basic information and selling products. 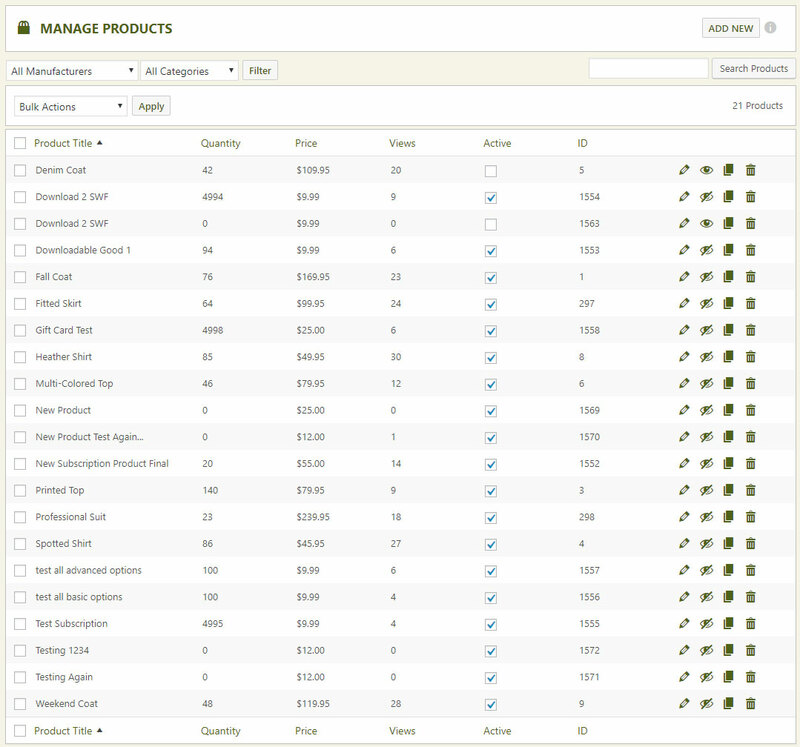 The main product display allows you to sort products by various headings as well as search for products. You can use the filters to also show only certain products by manufacturer or category. When you are ready to add a new product, simply select the ‘Add New’ button in the top right. To edit each product, you can select the pencil icon on the right hand navigation. Activate and Deactivate a product will turn it off at the store level and make it so that customers do not see the product. If you would like to duplicate a product, simply select the duplicate icon and then edit it for customization. EasyCart also offers bulk actions that allow you to easily select multiple products for delete, activate/deactivate, and export. You can also choose at the bottom of the display to show more products, up to 500 at a time for bulk actions. Note: Exporting all products can be a server intensive process and some servers may run out of time or memory during this process. IF you have more than 500 products, EasyCart will break your export file down into 500 product chunks and zip them together for you. This allows for more server compatibility across the WordPress community.